Remote Ocean Systems (ROS) is a leader in the development, design and manufacture of advanced technology inspection and lighting systems for the most severe offshore, oceanographic, industrial and military applications. The ROS product line includes the most complete selection of underwater video cameras, lights, pan and tilts and control systems available in the industry. ROS’ Quality Management System complies with ISO 9001 with a commitment to ensure customer satisfaction and continuous improvement. 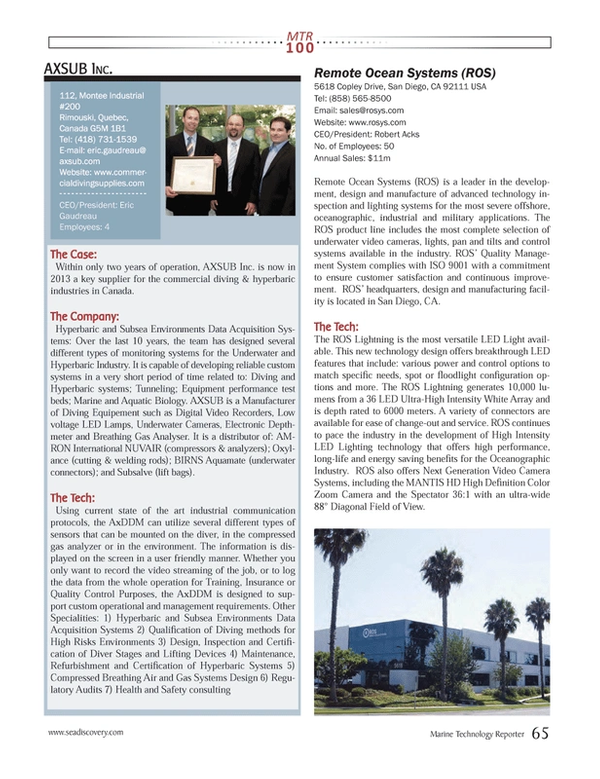 ROS’ headquarters, design and manufacturing facility is located in San Diego, Calif.. The ROS Lightning is the most versatile LED Light available. This new technology design offers breakthrough LED features that include: various power and control options to match specific needs, spot or floodlight configuration options and more. The ROS Lightning generates 10,000 lumens from a 36 LED Ultra-High Intensity White Array and is depth rated to 6000 meters. A variety of connectors are available for ease of change-out and service. ROS continues to pace the industry in the development of High Intensity LED Lighting technology that offers high performance, long-life and energy saving benefits for the Oceanographic Industry. ROS also offers Next Generation Video Camera Systems, including the MANTIS HD High Definition Color Zoom Camera and the Spectator 36:1 with an ultra-wide 88° Diagonal Field of View.